Source unknown. 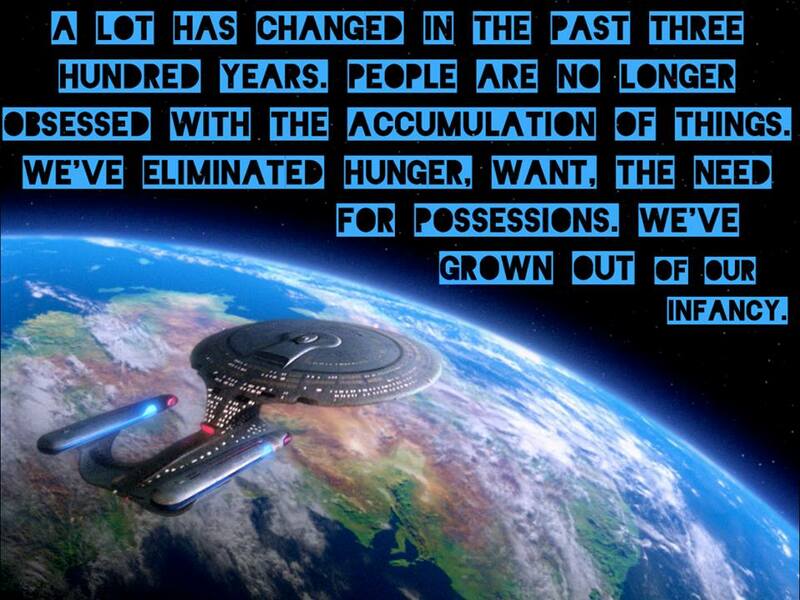 The quote, however, is from Captain Picard. My response is this: "Keep sayin' it until you believe it, Picard. And while we're waiting for that, explain how it is that Humanity is SO advanced that Voyager's crew gambled away their replicator rations (i.e. FOOD). Explain how it is that Quark managed to have a 'profitable' business on a Federation space station. Explain to the satisfaction of any intelligent, attentive listener exactly why it is they shouldn't laugh dismissively at the lie you just told." Actually, that's the response I did make. And the retort was that Quark made profits because the writing on DS9 was bad; that "the Ferengi never made sense...why would they care about 'gold pressed latinum' if any replicator could make it by the tons out of toilet paper?" Naturally, as explanations go, that one (the writing is bad) is completely unsatisfactory, as it is a meta-explanation that must resort to stepping out of the show's fictional setting. In other words, it's so bad that it can't be made within the scope of the show at all. How do you explain to someone "in universe" that he's "written badly"? An explanation must account for the things we see, which must take precedence over the things that are said. Where they differ, the person who's talking is mostly likely wrong. Besides, the value of latinum as a currency was due to the fact that it could NOT be replicated, as confirmed by Memory Alpha. Very little of what is said about Star Trek's post-scarcity economy jibes with what we actually see of the society in action. What we actually see is that when commodities grow abundant, the economy gravitates toward using as currency those things that remain scarce, such as the un-replicable "latinum" or artifically scarce rations. Far from outgrowing their "infancy", the people of that century go to extraordinary lengths to maintain it. Picard's statements would appear to be largely political propaganda. While the Federation's citizens pay lip-service to the idea of there being "no money" by the 23rd century, and that phrases like "bought" and "sold" were simply "figures of speech", a closer inspection of their actions reveals that this simply isn't true. Some examples are collected at Memory Alpha so I don't need to reproduce them here. But notable is the fact that the list of exceptions to the Federation's "no money" economy is longer than the list supporting it. Many of the missions of the Enterprise revolve around trade disputes and agreements. These would be unnecessary if everything could be had via a conversation with a replicator. Arguments that these "trades" are for the sake of maintaining relations fall flat: the moment the Federation revealed replicator technology, they would be exposed as manipulative liars, undermining the trust on which the relationship is founded. As it stands, no one really attempted to explain the transition from the Federation 'credit' of the original series to the supposed money-free society of the movies until the devaluation of the credit was featured in James Cawley's Star Trek: The New Voyages ("To Serve All My Days") as a problem that would have to be resolved. I find the best solution to the conflicting statements is that replicator technology is an energy-hungry technology that is most practical on the small scale. It provides only limited production capacity and requires extremely high energy availability. A space station or starship is a decidedly atypical closed environment which makes it unusually well-suited to the use of replicators (due to the absolute need for recycling and the surplus energy of matter/antimatter conversion. Our perception of the ubiquity of replicators is colored by the fact that all Star Trek series are based on and around space-based Starfleet locales. It's simply an example of a military technology that's not in widespread general use. This explains why farming is still hugely important to Federation planets, as we've seen in episode after episode of the original series and its successors. It's why shipments of mutant triticale strains were vital to the survival of Sherman's Planet in "The Trouble With Tribbles" and "More Tribbles, More Troubles". It's why the first thing colonies would do is establish agriculture. Outside of Starfleet and Federation government jobs, on the larger scale, trade is necessary. The agreements are as important as they are portrayed. And we know that people still engage in commerce, because we see them do it. But the lack of an accurate description of these facts points to the fact that it's not the Ferengi who are poorly written, but the Federation. But again, that's a meta-explanation. Staying inside the narrative allows us to infer quite a lot about the politics of the Federation... a politic that is merely hinted at, but which reveals the "post-scarcity economy" to be a political mantra. Picard is simply one of those loyal Party members who repeats it. It would not be the first time that an ideological narrative failed to jibe with reality. For instance, here in the United States we still proudly proclaim ourselves to be "The Land of the Free" though we are not the freest nation in terms of economy, or even in terms of Liberty. We imprison more of our citizens per capita than any nation on Earth. But we are "The Land of the Free". Wink, wink. I'm from a rather large "fused family". There are eight of us siblings and step-siblings. One of my sisters is what both of us would describe as a "tree-hugger". When I say it, I mean it as distinct from a conservationist. A conservationist takes personal responsibility for the environment. A "tree-hugger" would impose obligations on others that they don't necessarily follow themselves. A "tree-hugger" is in it out of emotion: he's just fine with cutting down a small forest to build a "natural" log cabin so as to be in touch with the environment; but would decry industrial foresting, even though it is plainly well-managed and renewable. Industrial farming is decried as bad, but Heaven forbid we should consider the environmental devastation if the Earth's seven billions all attempted to live off the land individually. I mention these things because they're examples of holding two diametrically opposed ideas in one's head at the same time... which is exactly what Starfleet officers do when describing their economy. Another example: that same sister would not eat meat that had been raised on our farm. Now, keep in mind that we raised the animals specifically to eat them, to be more self-sustaining, and to be closer to the source of production. Nevertheless, it was morally abhorrent to her to eat an animal that she had "known" (even though she never actually worked the farm, and her "knowledge" was theoretical at best). But it was perfectly OK in her mind to serve meat that had been purchased from a butcher. It is impossible to get from her a clear answer as to why the industrial harvesting of trees is atrocious, but the industrial slaughter of animals is acceptable... until you use the words "industrial slaughter", at which point it's a tragedy until the next meal. She simply doesn't accept that there's a conflict, and will not consider the proposition. Two competing philosophies reside in her head, and they've never met one another. Note that it's not what he actually said. People do eat meat, but it's artificially produced. (Actually, he said it was "inorganically materialized", but scientifically speaking, that's nonsense. Organic molecules are those complex molecules that contain carbon, whether they're in a living thing or not.) Remember, replicated matter is the real thing. They're the same molecules; they've just never been alive. But aside from that, note that it's completely acceptable to Riker to serve up live animals to those who require it. It takes quite a bit of selective attention to interpret any of this as 'veganism'. Under similar circumstances, a Vulcan would have stuck to vegetables. Nevertheless, people see what they want to see. 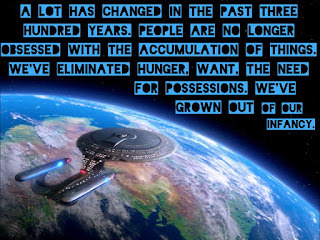 My friend maintains that the humans of Star Trek are vegans, though it's plain to see that they will readily eat meat. The record of meat on Federation tables extends before and after the Next Generation. Starships of Kirk's day had a galley, and he once ordered the cook to make sure their Thanksgiving meatloaf looked like turkey ("Charlie X"). Kirk would have enjoyed a chicken sandwich had it not been eaten by a tribble ("The Trouble with Tribbles"). Miles O'Brien stated that his mother used real meat when cooking ("Lonely Among Us"). Sisko's Creole Restaurant served up authentic seafood ("Homefront"). In point of fact, Riker's "no longer enslave" claim could easily be interpreted as preferring free range meat. Obviously, the circumstances of living aboard a starship would make this impractical. And even that doesn't stop the Bringloidi colony from bringing farm animals aboard as they were being relocated in the episode "Up the Long Ladder". Whatever the truth of the Federation economy (and diet), one thing is clear: 'Hoo-mans' are rarely honest about themselves, even when speaking amongst themselves, whether in the 23rd century or the present. For a show that is renowned for hiding pithy social commentary about contemporary issues within its storylines, this unintentional running gag is perhaps the most damning social commentary of them all.